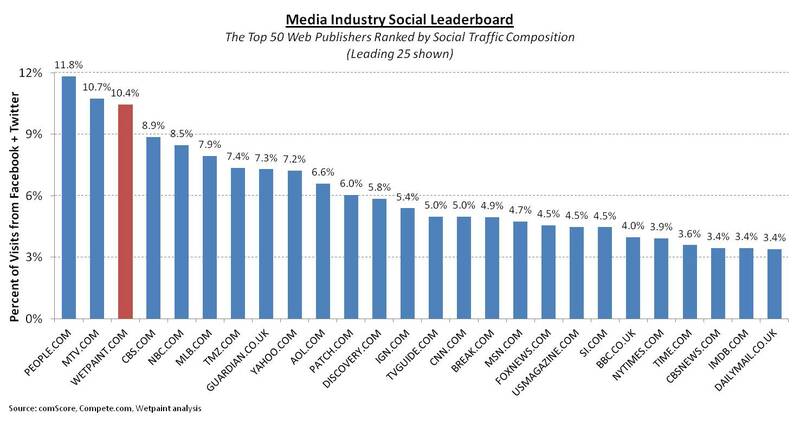 Back by popular demand is an updated ranking of the Media Industry Social Leaderboard. As a reminder, my company and I are obsessively focused on data about the social web – so much so, that we decided to track and publish not only our own results, but those of the top 50 media companies. This is all captured in the chart below which profiles the top 50 web publishers’ effectiveness at driving traffic from social media. For the inquisitive among us, you’ll note that we determine the top 50 relevant web publishers; then, using data from Compete.com, we determine and chart how much of their traffic is from Facebook and Twitter. One important note is that Facebook’s changes in its algorithms launched at F8 impacted nearly all publishers in this ranking – more on that in a moment. Facebook Traffic Down by 13%. The first thing you’ll notice is that the bars are lower this month. 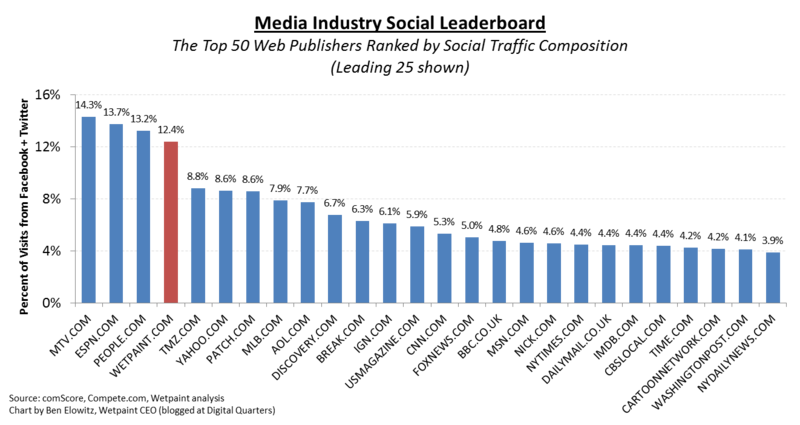 In fact, over 90% of the top 50 web publishers saw a decreased percentage of their visits coming from Facebook and Twitter in October, with the bars shortening on average by 50 basis points. In terms of aggregate performance, if you sum the total Facebook visits for all properties, they’re down 7.1% October vs. September, and 12.8% comparing October vs. the pre-F8 August highs. We believe this trend is the direct result of the F8 algorithm changes made in mid-September. Savvy social publishers (ourselves included) have been battling to reclaim previous highs since the F8 changes; but by October few had recovered. 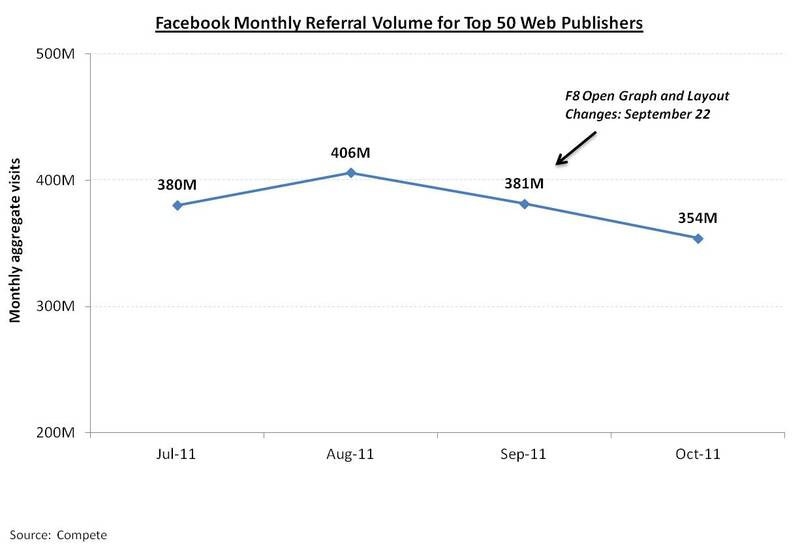 The chart below highlights the reduction in referrals from Facebook to publishers over the course of their algorithmic change. CBS has continued to fall in social traffic composition (-3.7% September-over-August, -5.5% Octocber-over-September), moving from the top rank on the Media Industry Social Leaderboard to number 4. Unclear what has caused this decline although one hypothesis could be an increase in either SEO or paid audience acquisition. If you have any insight here, shoot me a note. Closer to home, People, MTV, and Wetpaint maintained their relative rankings and have moved to the top 3 spots. 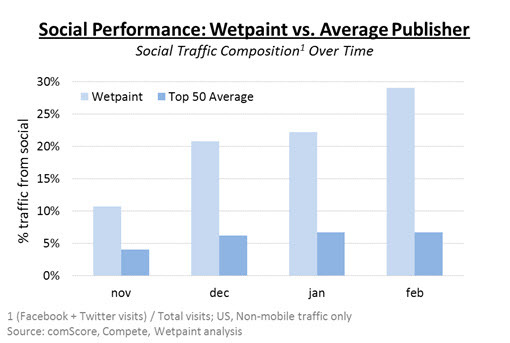 At Wetpaint, we credit our climb up the ladder to our relentless A/B testing that has allowed us to understand what our audience desires in a deep way, and inform our editors with this insight. The result is that we are creating, packaging, and distributing the right content, at the right time and our audience has voted with clicks, likes, and shares.